Year three the arts worksheets let your child dream of his future as a visual or performing artist. Creative spirits will enjoy learning about the history, present, and performance of visual arts, music, and more. If your child dreams of one day being a famous illustrator, he might enjoy improving his technique with step-by-step drawing worksheets. 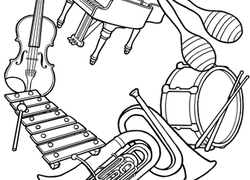 Kids who are bound for the stage can learn all about different instruments that they might want to play. Try these year three the arts worksheets with your creative kid. Put your knowledge about 3-D shapes into practise with this fun drawing lesson to teach you how to draw a pyramid. What delicious treats do we receive from trees? Your child can draw their favorite tree-provided snacks in this cute drawing worksheet. Here's a drawing lesson that also doubles as a geometry review! Learn how to draw a cylinder as you create a drawing of a mug. This drawing lesson has a geometric twist! Learn how to draw a sphere by starting off drawing an apple. Let's practise 3-D shapes with a fun drawing lesson! Kids will follow step-by-step instructions to draw an ice cream cone. Introduce your kid to a whole world of alphabet fun with bubble letters! Learn to draw a simple Diwali diya lamp with this worksheet, and celebrate the event with friends!